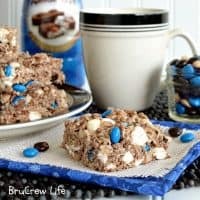 Almond Joy Rice Krispie Treats– packed with coconut flavor, chocolate, almond and gooey marshmallow! 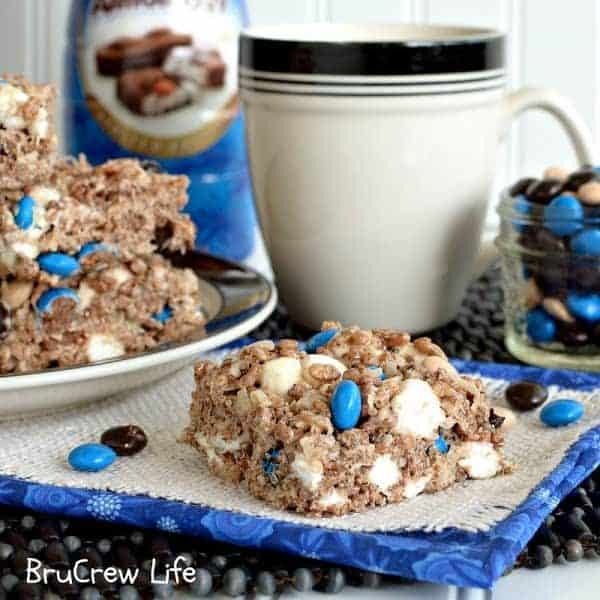 Today Jocelyn from Inside BruCrew Life is here to share a treat with you. Jocelyn is my blogger BFF. If you haven’t had a chance to read about her, you MUST. If you are a friend of mine, then you will love the treats Jocelyn makes. I mean come on, did you see the picture above???? Okay…take it away Jocelyn, I have some drinks with umbrellas to enjoy…. Hi, Shugary Sweets readers. Jocelyn from BruCrew Life here. I am so excited to be posting on Aimee’s blog today!! Aimee is pretty much my best bloggy BFF! We are like twins separated at birth. It is crazy how many things we have in common with each other, often sharing similar recipes and don’t know it until we post on the same day. Having a best blog friend is great for so many reasons. We have the same baking addiction! One thing I know about Aimee is how much she loves homemade rice krispie treats. Just a peek through her archives and you’ll see all the delicious flavors! Today I have some fun rice krispie treats to share with you. I decided to include a few more of Aimee’s favorite things in these treats, just to make it a little more personal. They have coffee and coconut mixed in with all the marshmallows. That makes these pretty much the best rice krispie treat evah!!! What’s that? You don’t like coconut? I guess you could leave it out, but then you are missing out on the experience. My youngest even ate some and said that he really liked them, and he doesn’t even like coconut at all. So if the 8 year old can handle it, so can you!!! Thank you so much Aimee for having me visit your blog. I loved sharing a specially made treat for you and your readers! In a large saucepan, melt coconut oil. You can substitute butter if you prefer. Add in the instant coffee granules and heat until dissolved, stirring constantly. Add in one bag of mini marshmallows and stir until melted. Remove from heat. Combine the chocolate krispie cereal with the mixture and stir until coated. Add in shredded coconut and extra mini marshmallows. If you can find the Almond Joy pieces, add those too! 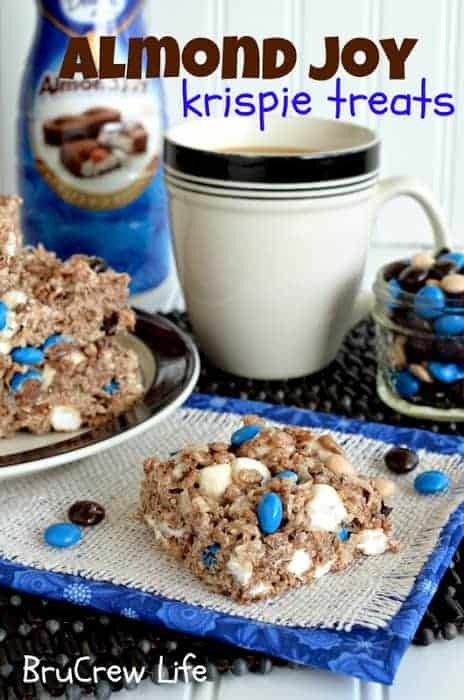 You can also use Almond M&M’s or chopped up Almond Joy candy! Spoon into a buttered (or parchment paper lined) 13×9-inch baking dish. Press gently into the pan. Add extra candies on top. Allow to set for about one hour, cut and enjoy. Store covered loosely at room temperature. The extra marshmallows are important for giving this treat that extra bit of gooey texture. Speaking of texture, don’t press the krispies too hard into the pan or you will result in having HARD krispie treats. Also, in regards to the marshmallow, the fresher the better! Get the secret tips and tricks to making the most PERFECT Rice Krispie Treats. Kid and adult friendly! The original THICK AND CHEWY, gooey dessert! I’ve created THE ULTIMATE Rice Krispie Treat Flavor Guide. 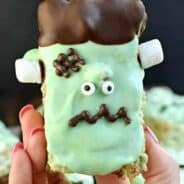 Everything you need to know about How to Make Rice Krispie Treats with all the fun flavors and styles! Want just a classic Chocolate Krispie Treat? These are thick and chewy just like the original! Almond Joy Rice Krispie Treats- packed with coconut flavor, chocolate, almond and gooey marshmallow! In a large saucepan, melt the coconut oil. Stir in the instant coffee until dissolved. Add the mini marshmallows and stir until melted. Remove from heat. Pour in the cereal and stir until coated. Add the coconut, extra mini marshmallows and 1 cup Almond Joy pieces, stirring quickly. Spoon into a buttered 9x13 pan. Gently press into the pan with buttered hands. (pressing too hard will result in hard krispy treats) Press the extra chocolate pieces into the top. Let set up. Store covered loosely. If you can't find the Almond Joy Pieces you can either use Almond M&M's or chopped up Almond Joy Candies! These look fabulous! Love all those colours in there too! I’m drooling over these all while enjoying some delicious iced coffee with almond joy creamer (the best stuff ever). I HAVE to make these!! Amazing! I love almond joys! Great recipe!!! I am a total coconut fanatic! These are definitely calling my name! Oh, man. You know me and coconut. These are perfect! Whoa! Combining the taste of Almond Joy and Rice Krispie Treats is genius! Two of my absolute favorite flavors in one! So perfect for boxing up and giving as a little treat for a friend who is going through some tough times. 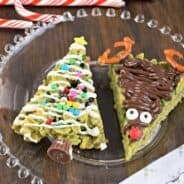 What a fun treat to make with my kids! 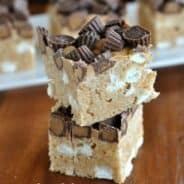 They love Rice Krispies and this is a fun spin they will definitely enjoy! These are delicious! Thank you so much! I love the color in them, and the fun twist on Rice Krispy treats. My family will love these! You had me at coconut!! This will quickly become a favorite at our house! Yum, yum!! I sure love adding goodness to rice krispies! Thanks for the idea!